Celebrated TV Journalist, Larry Madowo just got admitted into Columbia Journalism School a day before the day he joined BBC, last year. It must be overwhelming for him, since this was a pleasant surprise for him and we do hail him for it all. His hard work and consistent focus has born him nothing short of fruitful and lucrative positions in the media industry. On his Instagram page, the multi-talented journalist expresses: On social media, fans are all ´Congratulations´ to the BBC Business Journalist and wish him nothing but a much more fruitful future, all round. Many thought he was actually celebrating his birth date but he clarified: Guys, it´s not my birthday. It´s my work anniversary. Comment section Media personalities and celebrities, flooded his Instagram page showing him nothing but love. Female gospel artist, Mercy Masika expresses: That I can imagine is the best gift, and weapon but I join you none shall prosper. Happy birthday. Fans and followers also shared: Happy birthday. Mob blessings in your new year. Happy birthday @larrymadowo  Happy birthday Larry❤ Congratulations Larry!!! And on and on and on… Well, Congratulations to the smart toiler! 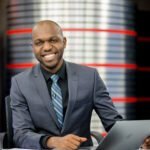 The post Celebrated Journalist, Larry Madowo celebrates his 1st Anniversary at BBC appeared first on Ghafla! Kenya.